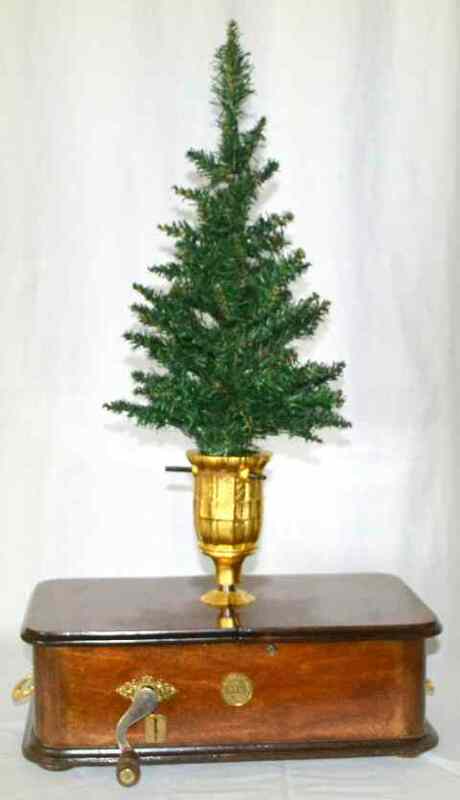 I saw an Imperator Christmas tree stand music box on ebay. The seller was Dutch (Utrecht). I did not win that auction. AV Ad van Selms, Den Haag, said my last bid was much too high. Then a month later I saw what looks to me to be the same music box. This time the seller was in Miami, Florida. The auction was a "buy it now", so I made an offer. This time I got it. The picture is on the left. I have bought a small, artificial Christmas tree lighted with battery powered LEDs. I am not crazy enough to try a real tree and real candles. A little research (all in articles written by Ad) informed me that Richter made Christmas tree stand Imperators in three sizes. This one is the smallest - a D mechanism. Continuing with the Christmas theme, the builder's page. has pictures of a crèche by AV Wolfgang Fichtner, Hartha, Germany. There are a few new pictures of the grandkids at picture of me, my granddaughters, and my cats. I have no news yet about the next Anker Treffen in 2014, not even whether there will be one. For the month of December, 2013.